Using a modern vibe with many classic influences blending into one cohesive sound, Jeremy Porter and the Tucos fuses a simple but highly effective sound on their latest album, Above the Sweet Tea Line. They claim influence from disparate sources ranging from Cheap Trick to Gram Parsons to Merle Haggard to Ted Nugent, but we hear other musical fusion angles like The Replacements meets Wilco or, more generally power pop meets punk meets alt country. In any case, the album is interesting and entertaining throughout, which is all that really matters. Composer, vocalist, and guitarist Jeremy Porter is originally from Michigan’s upper peninsula, where he founded one of the region’s sole punk bands, The Regulars, in the 1990s. 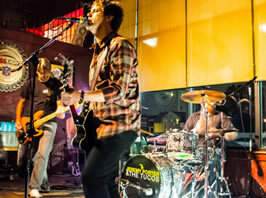 After migrating to Detroit, Porter fronted, recorded, and toured with several groups before forming The Tucos in 2009 with bassist Patrick O’Harris and drummer Gabriel Doman. The trio recorded and released their 2012 debut LP, Partner In Crime, as well as honed a successful live repertoire which brought them to many locales in the U.S. and Canada. Porter and Doman teamed up with brothers Tim and Andy Patalan to produce Above the Sweet Tea Line, which was recorded at the Patalans’ converted rural Michigan hayloft studio called The Loft. The production team strived to strike a balance between getting the best musical performances and keeping things loose and fun, a method which often stumbled upon “happy mistakes” which ended up enhancing the final product. Porter composed each of the 10 tracks on, Above the Sweet Tea Line, but with collaborative arrangements and other input from the band members and producers. The opener, “Josh” , starts with a sustained drone sound preceding the heavy guitar intro. Lyrically, the track is a literal interpretation of a pet cat’s swagger and activities, while a blazing guitar lead dissolves into a calm, sustained outro, which starts things off on a high note. “Bottled Regrets”, is another strong tune featuring good melodies with a nice backing vocal chorus featuring guest Stefanie Christi’an. The lyrics of this track seem to tell about trying to break through in the music industry and the song concludes with a great ending guitar lead above hand-clap-like addition percussion. The album wraps with three tracks of diverse styles. “Sounds Like Goodbye”, features another retro feel but with a fresh, modern twist, along with a nice vocal effect in the verses and harmonies in the choruses and the very simple theme of getting rid of someone who has overstayed their welcome. “Sleepy Eyes”, is a solo track by Porter, featuring nicely picked acoustic with many of the same qualities as the intro of the song, “I’m One”, from The Who’s Quadrophenia, albeit this track never relents from its basic arrangement. “Trouble In Paradise”, is a strong closer with rockabilly sound reminiscent of Tommy Conwell, as well as some nice, overdubbed piano by Doman underneath Porter’s fine closing guitar lead. Jeremy Porter and the Tucos are currently taking a couple months off the road to record the first few demos for the follow-up to, Above the Sweet Tea Line. At the time of this publication, they’ve currently got about a half dozen new songs and plan to do another batch of pre-production demos in 2016 before returning to The Loft to start recording the new album. They also have an ambitious touring schedule planned for the new year and hope to be hitting cities where they haven’t yet played.